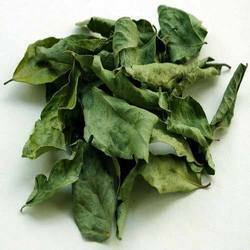 We are one of the reliable organizations in this domain and are into presenting an enormous quality range of Curry Leaves to our customers. These Curry Leaves are mainly used for seasoning and flavoring in various dished. Besides, offered products are completely fresh and can be availed from us at feasible rates. Packaging: Packing is available as per client requirement. Carefully picked and packaged mature Curry Leaves can be availed from us. Having maximum flavor, these rich curry leaves are used for enhancing the flavor of different kinds of cuisines in different regions of the world. These dark green leaves have a strong aroma and can add the right flavor to any dish. Moreover, these are high in vitamins and minerals. We are one of the well-distinguished companies in the market that are into offering Curry Leaves.